It means that a lot of people are getting bored with just mindlessly copy/pasting ads or photo-spamming / photo-tagging people in Facebook. 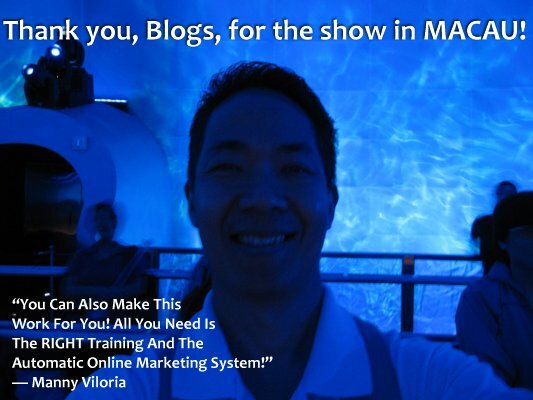 At Team Manny Viloria, we have been encouraging you since long ago to start blogging. Right from the start, we focus on adding value. And when YOU focus on value, you won’t need to desperately underprice SWA Ultimate just to grab as many downlines as you can. I suggest you start Blogspot.com blogging, or regular “add text and photos” style of blogging. This will help spread your name on the internet, and when people search for your name in Google, they will see the things you have published online. You don’t need to be a writer or a techie. You just need to share useful or entertaining stories. You don’t need to write in English; you may write in any language. Just please keep in mind that if you want to reach people in the United States, Canada, Australia, or other countries where they do not speak your own language, it will be to your benefit if you write in English. Sometimes, we give English tips online, such as on my Facebook wall. And in Team Manny Viloria, we also have a “Blog Writing Done For You” service to help you see how your short email can be transformed into a 100-word blog post. There’s no stopping it… More and more SWA Ultimate members will move towards Text Blogging and Video Blogging. More and more online publishers will focus on GIVING VALUE, because that is the way forward. So enter your Name and Email Address on the right, get more updates and tutorials inside the SWA-PINOY mailing list, then Join Team Manny Viloria today!